« How Are Our Readers Discovering Books? In just a few days’ time thousands of librarians will descend on Las Vegas for the 2014 America Library Association (ALA) Conference. The last time ALA was there was 1973 and Vegas was a much different place. From a suite of rooms atop the Desert Inn, reclusive mogul Howard Hughes was attempting to take over by buying up the whole town. The Mob lived large, taking the skim out of casino count rooms, and making sure that their problems wound up buried in a lonely part of the desert outside of town. But the 70s ran out of gas (quite literally), and the 80s brought in the junk bonds kings and the corporate boards. They chased out the wise guys and ran thing the business way. In the 90s there was a flowering of mega resorts built around romantic themes and a past that never was. Vegas made a bid for the family vacation crowd with pirate ships, the USS Enterprise, dragons, and pyramids. But the long time residents knew that appealing to families was only a fad, and that the old of Vegas would return. Sure enough by the 2003 even the Las Vegas Convention and Visitors Authority tourism board was advising people of what to expect with their official advertising slogan: “what happens here stays here”. “Sin City” had reawakened. Las Vegas, Spanish for “the meadows”, has always been an outlier in the vision of America. A one stop railroad town, thrust into prominence by the largesse of the federal government (Hoover Dam and military training bases for World War II), legalized gambling, and the vision of a charismatic mobster who was too far ahead of his time. Commentators try to use it as a symbol. Some view it as paradise; the ultimate expression of the American Dream where Jane or Joe Blow from Nowhere, Middle America can walk into the casino, make one throw of the dice, and emerge a millionaire. Others see it as the dark side of the American ego, an Id of sin and vice, that will one day be turned to ash like that other long ago desert den of iniquity Gomorrah (assuming Vegas itself just does not one day dry up and blow away when the last drop of water runs out of the Colorado River into some master planned community’s swimming pool). Perhaps that’s why many works of speculative fiction use Vegas as a setting. After all, it is a phantasmal kingdom of ancient palaces and neon wonder. A city that exists where no city has right to exist, in defiance of the stark desert that surrounds it. And, a city in the constant process of reinventing itself tearing down the old to build up the new. In a place such as that, one could almost believe that magic is real. 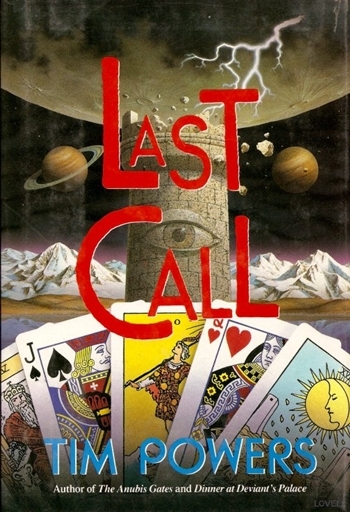 One of the best speculative depictions of Las Vegas is the novel Last Call (1992) by Tim Powers. Last Call tells the story of gambler Scott Crane and his involvement in a magical poker game to determine the fate of his own soul as well as that of Las Vegas. Along the way he clashes with the ghost of Benjamin “Bugsy” Siegel (the man who built the Flamingo Hotel and Casino), ancient tarot decks, and other magical manifestations, in a journey that takes him form the highways and poker rooms of Los Angles, the glitz and glamor of the Las Vegas Strip, and the desert wonderland outside of town. Drawing upon the tarot, the history of Las Vegas, poker games, and Arthurian Myth (the legend of the Fisher King plays a major role in the book) this is an exciting read that paints a picture of a fascinating world of magic underlying our own mundane reality. Check it out, and form your own conclusions about just how much luck, magic, and fate combine in the never sleeping reality of Las Vegas. Last Call forms part of a trilogy called Fault Lines. The second volume, called Expiration Date (1995) is set in California and follows the battles between magicians who consume ghosts for power. The third novel is called Earthquake Weather (1997) and involves characters from the other two novels in a new set of adventures. The Stand (1978) By Stephen King – Las Vegas as America’s Id plays a major role in this book. Randall Flagg, The Walking Dude, is the baldest of the bad, and there is only city that can serve as the base of his new empire. There is a mediocre 1997 television mini-series. It has a great opening (The Best Use of Blue Oyster Cult’s classic hit Don’t Fear the Reaper on screen ever (sorry SNL fans), but little else to recommend it. “The Last Illusion” in The Books of Blood: Book VI by Clive Barker – Harry D’Amour, Clive Barker’s supernatural private investigator, takes the case of Swann, a stage illusionist confronted by demons. It was adapted into a decent 1995 movie entitled Lord of Illusions, written and directed by Clive Barker Himself, and starring Scott Bakula, Kevin J. O’Connor, and Famke Janssen. Fear and Loathing in Las Vegas: A Savage Journey to the Heart of the American Dream (1971) By Hunter S. Thompson. A bit of cheat as it is a work of non-fiction, but the picture painted by Thompson as he and colleague Dr. Gonzo embark on a drug fueled odyssey through the seedy underbelly of Las Vegas is as nightmarish as any work of horror. Terry Gilliam translates many of these visuals into freaky life in the excellent 1998 movie version starring Johnny Depp as Hunter S. Thompson and Benicio Del Toro as Dr. Gonzo. That is the only tip of the iceberg however. Leave a comment and tell us your favorite work of speculative fiction that features Las Vegas. Lastly, it just would not be Vegas without a bit of shameless self-promotion. If you will be attending the ALA 2014 Conference, and you find yourself with a hole in your schedule on Saturday, June 28th from 4:30 to 5:30 pm, consider stopping by Las Vegas Convention Center S233 (where its scheduled, but check your schedule when you get there for any last minute changes) for the panel “Redefining Humans from the Past to the Future”. A popular panel at every Annual Conference this is your chance to hear speculative fiction authors talk about their profession and the work. Presented by Tor Books and the Imagineering Interest Group of the Library Information and Technology Association (LITA) Chapter of ALA. Further information about the panel is available at the link: http://ala14.ala.org/node/14574.